With the wet and miserable weather we’ve been having and promise of more to come this winter, I decided to fit a fender extender onto my Fazer. That’s a front mudguard extension for you UK lot. The plan being to stop a whole pile of crud, muck and wet getting sprayed up into the radiators, downpipes and headers, which are already showing a bit of weather damage. I picked this Fender Extender up from M&P and it’s made by Pyramid Plastics. Looks wise, it’s a not a lot to write home about, just a basic matt black piece of plastic, but fitting against the mudguard was decent enough. It was supplied with some self tapping screws and some sticky back tape to hold it place whilst drilling holes for screws. I really didn’t fancy drilling through my mudguard, so I binned the screws and opted for some glue. My tube of Tiger Seal had dried up, so I picked up some Sikaflex EBT glue from my local ScrewFix. Four bolts removed and the mudguard came off easy peasy, which made it a damned sight easy to glean all the crud off and wipe it down with a spot of meths to ensure a clean and grease free surfaces for the glue to bond well with. Some big clips then held it well until the glue set. 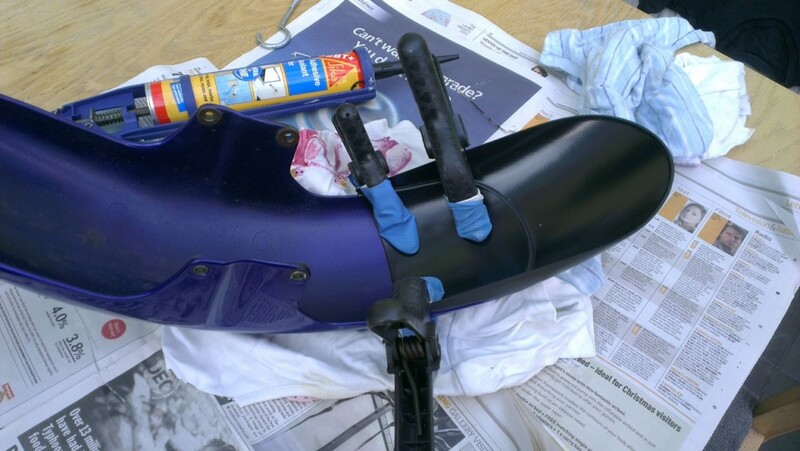 To stop the clips marking the mudguard I cut off the fingers of some old rubber gloves and stuck them over the ends. Classy. 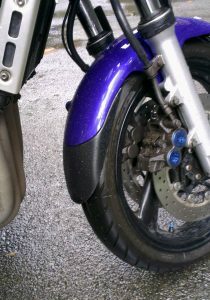 Once the glue had set, it was a simple matter of refitting the mudguard back on the bike. Visually, it is a subtle addition that is not immediately obvious. But it’s the practical side that is of more interest, and a decent job it does too with far less crud and grit getting flung up from the road and into the radiator. Perfect for the upcoming winter when the salt trucks come out and not bad for £20. Search for a Fender Extender off Ebay .